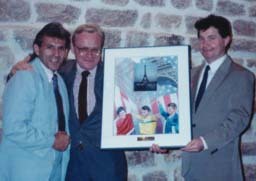 As part of the 100th year anniversary of the Eiffel Tower, I presented an oil painting of his 1987 "The Vertical Mile - A Climb For Health" to Eiffel Tower Officials, Mr. Christian Marequier and Mr. Bernard Hebert on June 16, 1989. Silva scaled the Eiffel Tower 7 1/2 times (2 hours, 2 minutes, 54 seconds) to complete the Vertical Mile. This event drew international attention by demonstrating that it is never too late to begin leading a healthier lifestyle. 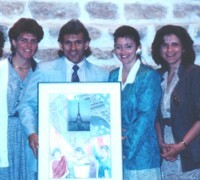 And if you ever get to the Eiffel Tower, check out the offices under the north tower - the picture hangs there. (1989) It might still be there! Philadelphia, October 10, 1990, Climbing the Rocky steps! Here kicking off a year long goal to climb "A Million Steps for Health" by climbing a Vertical Mile on the steps of the Philadelphia Art Museum. Rocky only climbed them once, I did 180 round-trips. October 10th, 1991, finishing the "Million Steps Climb" at Giants Stadium in New Jersey. Completing a Vertical Mile and bringing my total number of steps climbed in one year to 1,335,545 steps, or 89,036 flights of stairs. Another World Record. Steve has appeared on television, radio, hundreds of newspapers, magazines and makes personal appearances. Peachtree Plaza Hotel 39 times. A total of 45,708 stairs in just under 10 hours. That is the equivalent of running 4.2 marathons! 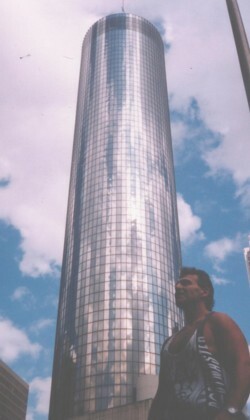 Here I am in front of the Peachtree Plaza Hotel in Atlanta, where I shattered the Marathon Stair climbing Record.